This recipe was inspired by Allison Rivers Samson. As well as the many other “mock-tuna” or “tuna-less” recipes we came across. I just made this yesterday and nobody even suspected it wasn't the 'real deal'. I was a bit sceptical but should have known that if Rouxbe said it was good, it would be! And I was right. I have never been disappointed with all the recipes of yours that I have tried. I found it difficult to mash the chick peas so might give them a whirl in the food processor next time. I also couldn't find the flakes but crunching up the sheets of seaweed worked just fine. I will be using this lots in the future. Hi Judi- we are thrilled that you enjoyed this recipe so much. I think it has a great, deep flavor and an agreeable texture. 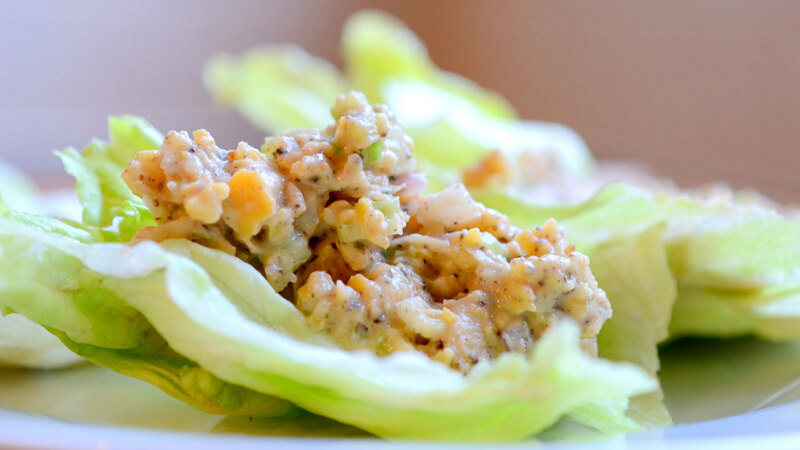 Perfect for crackers or lettuce wraps. Enjoy! What would be the right ratio to start recipe to hydrate dried garbanzo's? Hi Brenda- You need 3 cups of cooked chickpeas for this recipe. 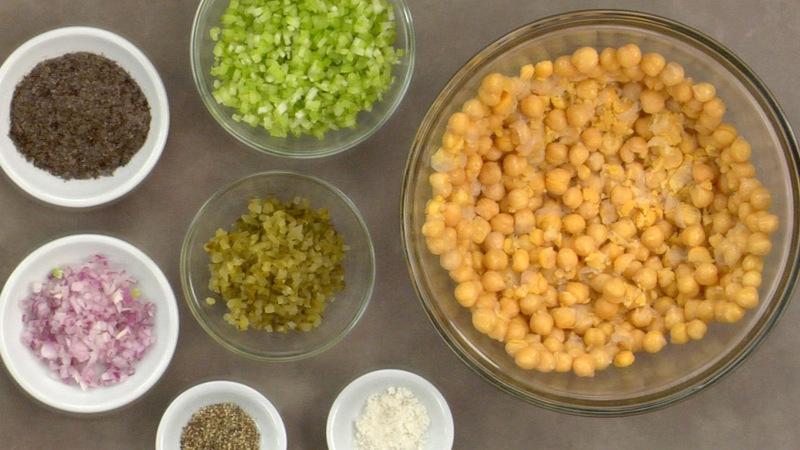 Dried beans usually double or triple in volume when cooked, so start with a cup or 2 of dried chickpeas. You can always use the leftovers for hummus. I hope this helps! This is amazing! I made a "blind test" with my mother and asked her what is was. She said: tuna! I said: Yes! Except that... there is no tuna! hahaha Fun! I really enjoyed this recipe. Is good with crackers, lettuce and even with a steamed pumpkin I had already done for lunch. The sweet and creamy texture of the pumpkin was a perfect match for the crunchy and salty salad. I didn't have flaked nori nor a grinder to use. So I put the nori sheets in the oven just enough to make it very dry. Then, I immediately crunched the nori sheets with my hands. That produced a little bigger flakes than the nori bought flaked but it is fine for me, I love seaweed. Nice work Rosana—I love the idea of doing a blind taste test. And thanks for the tip on the nori sheets. Cheers! I am so happy that you folks decided to add a plant based cooking course to the school. As Orthodox Christians we fast every Wednesday and Friday and during Lent and other times which means no meat, no dairy, and no alcohol or olive oil. So having options besides beans and rice or rice and beans is really great and creates a whole expansive base of recipes and ideas. This recipe is really good and is definitely going to be used as well as are a lot of the other recipes in this course. Thanks again Rouxbe! So glad to hear that Andrew! Keep up the great work — it sounds like you have one lucky family with all of the cooking you do. Cheers! At first, I did not think this salad would taste anything like “tuna salad”, but I was wrong. 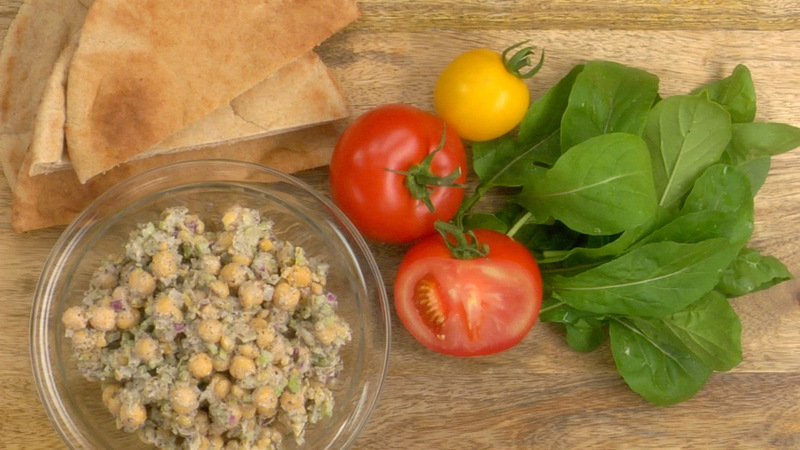 I just tried this salad the other day, and so far, people which I gave a taste to, loved it (including me), and couldn't believe there was no tuna it. Just made this for dinner, it was amazing. What a great oppor-tuna-ty it presented me with, to show my non-vegan friends how tasty plant based food is! Thank you. Hello, English is not my native language and I am confused about what pickles are... I read that pickles are vegetables preserved in vinegar but it can also be a sort of spread used on sandwiches. What kind of pickles are you referring to in your recipe? If you refer to the vegetables preserved in vinegar, which ones are they? (onions? Peppers? Gherkins?) Many thanks!! This is and excellent recipe and is very flavorful. I like to hand chop the pickles, red onion, cilantro, celery and use the vitamix to grind the nori. I think half sour pickles (particularly if you ferment your own) work best. Use a food processor to chop up the chickpeas, adding a bit of the veganease and salt and pepper, and then add this to the hand chopped items. it gives a nice variety of textures and it hold together nicely for sandwiches. I've made many versions of mock tuna over the years and this one is by far the best! I grind nori sheets in the blender and make a simple vegan mayo from tofu, lemon juice, and dijon mustard. Tonight I served it as the filling for a lettuce wrap. One of my favorite recipes from the course. I just made this and we found it to be a little salty. I used Himalayan pink salt which I like the flavor of and find not as salty as conventional table salt. I would also destring my celery before chopping it, that way there aren't little celery " hairs" to try to chew up and choke on. I have also used kelp powder in a similar recipe which worked just as well as the seaweed and didn't give those little black spots, in case that was off putting to some people. I found it rather quick to put together which was nice, I do not like pickles or seaweed and I did not taste either of them in this dish, even though I knew they were in there. I had trouble holding the onion together after I made the horizontal cuts, any suggestions? I did chop up the onion to freeze or later use. can dried kelp be used as a substitute? I've cut the recipe in half since I'm single and don't want to waste or have to eat it more then 2x a week, this works great for me. love this !